To help commemorate the 65th anniversary of D-Day Aces High be exhibiting at Airborne Museum, Sainte-Mère-Église. If you are visiting Normandy to take part in the celebrations, be sure to visit their display at the Airborne Museum in this historic location where US paratroopers of the 82nd and 101st Airborne Divisions landed during the early hours of D-Day. Also, in commemoration of the 65th Anniversay of D-Day and to honour the men of the 82nd and 101st Airborne Divisions, Aces High have released a new print by Richard Taylor. Entitled “Ste Mère-Église”, Richard’s detailed new drawing depicts the link-up between paratroops of the 82nd and a Sherman Firefly tank of an unidentified armoured unit. Also depicted is the famous parachute of one of the 82nd troopers who got caught on the church steeple. In 1942, the 506th Parachute Infantry Regiment was created at Camp Toccoa, Georgia, to train an elite Airborne Regiment who would bravely jump behind enemy lines as part of the Allied invasion of occupied Europe. During the early hours of D-Day 6th June 1944 these paratroopers spearheaded the attack on Normandy, with Easy Company of the 101st Airborne Division playing a vital role in this advance. 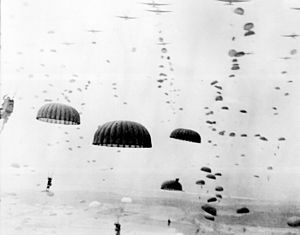 Fighting throughout Normandy, Easy Company were then assigned to Holland to support the British forces in Arnhem as part of Operation Market Garden. Several months later the entire 101st Airborne Division fought in freezing conditions in Belgium during the Battle of the Bulge before finally advancing to Berchtesgaden to capture Hitler’s Eagles Nest. Corporal HERB ‘Jr’ SUERTH – 18 year old Herb Suerth enlisted as a volunteer for the Reserve Engineer Corps in November 1942, but after a change of heart in 1944 he was assigned to 101st Airborne Division, beginning the parachute school training in August that year. After final combat training in Holland, Herb was trucked into Bastogne in December 1944 during the Battle of the Bulge, also fighting in Foy. In January 1945 Herb was wounded by the artillery fire and his legs were severely injured but ultimately saved. As a result of these injuries Herb was shipped back to the US during April 1945. Sergeant AMOS ‘Buck’ TAYLOR – Having worked in a factory making Sherman Tanks, Buck aided the war effort even further by becoming a Paratrooper and enlisted in July 1942 before being assigned to 3rd Platoon upon his arrival at Toccoa. When jumping into Europe on D-Day he was 2nd Squad Leader but having scattered on the jump, it was not until several days later that he joined up with the rest of the company, just prior to the attack on Carentan during which he was made 3rd Platoon Sergeant. At the Battle of the Bulge, when advancing from Bastogne to Foy, Buck was badly injured when shot in the leg which saw the end of his war spending 11months in hospital. Operation Market Garden and the Battle of the Bulge. Sergeant PAUL ROGERS – Aged 24, Paul Rogers volunteered to be a Paratrooper in 1942 and soon found himself at Toccoa training under Colonel Sink. When jumping into Europe on D-Day, Paul lost most of his equipment, including his rifle, and his parachute snagged on trees from which he had to cut himself loose; he later found out he had landed eight miles from the intended drop zone. With the 3rd Battalion he fought throughout Normandy but was injured when jumping into Holland as part of Operation Market Garden and subsequently spent four weeks in hospital. Upon rejoining the platoon he stayed with them all the way through to Hitler’s Eagles Nest in Berchtesgaden. He walked as tall as Alvin York and Audie Murphy. But they earned their combat records in World Wars I and II. Joe earned his medals in that unpopular war. That place called Vietnam. At the age of 17 Joe enlisted in the Navy. He liked the service life and planned a military career. But when it was time to reenlist in 1961, he changed to the Army. Joe ended up with the 101st Airborne Division and went to Vietnam where he earned The Congressional Medal of Honor. …Company D. was assualting a heavily defended enemy position along a river bank when it encountered a withering hail of fire from rockets, machine-guns and automatic weapons. He rallied several men and stormed across the river, over running several bunkers on the opposite shore. …..With utter disregard for his own saftey, he moved out under the intense fire again and pulled back the wounded, moving them to saftey…Joe was seriously wounded, but refused medical aid and returned to his men. With the relentless enemy fire disrupting the attack, he single-handedly stormed three enemy bunkers, destroying them with hand grenades and rifle fire, and shot two enemy soldiers who had attacked and wounded the Chaplin…. Finding his men under heavy fire from a house to the front, he proceeded alone to the building, killing its occupants with rifle fire and grenades By now his initial body wound had been compounded by grenade fragments, yet, despite the multiple wounds and loss of blood, he continued to lead his men against the intense enemy fire…. Joe was wounded seven times that day. But he wouldn’t allow himself to be removed from the battlefield until all his men were safe. He finally passed out from loss of blood. He regained consiousness in a field hospital. But Joe was still worried about his men, young men who depended upon the experience of the 29 year old sargent. The next day he stole a rifle and hitched a ride back to his outfit. Technially, he was AWOL. But by the time the Army found him two days later, Joe had been wounded again. President Richard Nixon pinned the Medal of Honor on Joe, who had been comissioned a 2nd Lt. He went on a speaking tour across the nation. Then he asked to go back to Vietnam. After two combat tours in the war, Joe had received 37 medals. 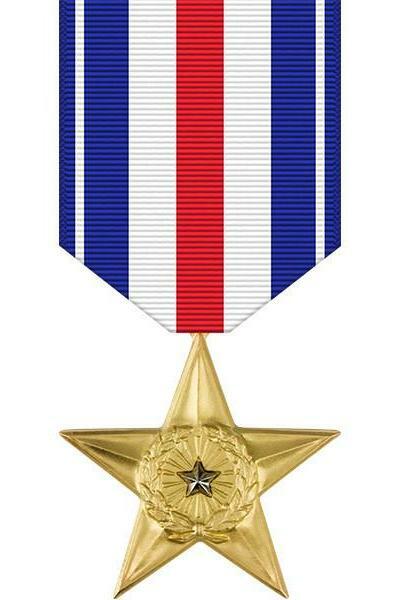 They included two Silver Stars(one of them had started out as another recommendation for a second Medal of Honor), six Bronze Stars and eight Purple Hearts. Joe returned to duty at Fort Polk, La. where he was training recruits. But he didn’t fit in well with stateside duty and he resigned his comission in 1972. Joe was disillusioned by the Army and its lack of discipline. He believed that discipline and training were what paid off in combat. Joe’s wife said he cried that day as he watched the news films showing the last of the American forces being pulled out of Vietnam. He told her all those lives and all those broken bodies had been wasted. He said we had accomplished nothing. Joe made many speeches about his combat experiences. He told a reporter he could smell the enemy. That was Joe Hooper’s philosophy in life. You do what you have to do at the time and face tomnorrow when it arrives. Joe was in Louisville, Kentucky for the running of the Kentucky Derby, when he died on May 5,1979. He was found in a hotel room. He was 40 years old. He died a quiet death from a cerebral hemorrage while sleeping. THANKS TO EVERYONE WHO READS MY BLOG, I HOPE YOU CONTINUE. I INTEND TO CONTINUE TO BLOG ABOUT THE SAME TOPICS, I WILL STILL BE OPINIONATED! Is like those who’d fall out of their last jump school run. Your feet in the door, your heart pounding with fear. For the jump wings they seek and the glory they gain. Ensuring only the best and the hardest remain. And playing at tough is just not enough. And never one thought of retreat from the field. And go all the way till the fight is no more. But most Libs are quitters, who won’t finish the run.